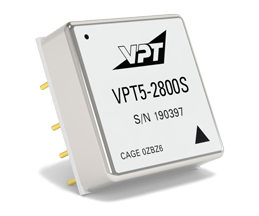 VPT5-2800S DC-DC Converter | VPT, Inc. Ideal for military vehicles, avionics, weapons, shipboard, and other hi-rel applications, these converters are based on proven military heritage designs and ready for rugged duty. To provide you with the most accurate data for the actual performance of this product once deployed, please note that the electrical performance data provided below is at Tcase = -55° C to +100° C, Vin= +28V ±5%, full load, unless otherwise specified.